Active@ Data Studio contains a set of both desktop applications and a bootable image for booting up any system into a DOS or Windows environment. Whether you need to perform data recovery, data imaging, or to securely erase data, Active@ Data Studio allows you to run the utilities from within Windows or to boot a system up from a self-contained boot environment. Need to backup & restore your disks, recover deleted documents & photos, erase disks securely, monitor HDD health, or even repair PC when Windows can’t start normally? 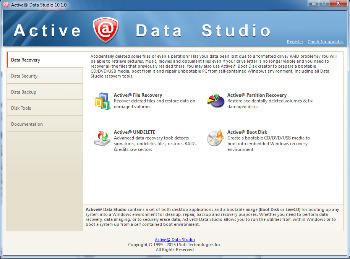 Active@ Data Studio is a set of both desktop applications plus a bootable CD/DVD or USB Disk for booting up any system into a Windows Recovery Environment. – Active@ Partition Manager – creates, deletes, edits & formats partitions on your computer. Active@ KillDisk — powerful and compact software that allows you to destroy all data on hard disks, USB drives completely, excluding any possibility of future recovery of deleted files and folders. It’s a hard disk drive sanitizing tool and partition eraser utility, supports 23 security standards including DoD 5220.22-M.